High Quality Content by WIKIPEDIA articles! In geometry a triangle center is a point in the plane that is in some sense a center of a triangle akin to the centers of squares and circles. For example the centroid, circumcenter, incenter and orthocenter were familiar to the ancient Greeks, and can be obtained by simple constructions. Each of them has the property that it is invariant under similarity. In other words it will always occupy the same position (relative to the vertices) under the operations of rotation, reflection, and dilation. Consequently this invariance is a necessary property for any point aspiring to be a triangle center. It rules out various well-known points such as the Brocard points, named after Henri Brocard (1845 ? 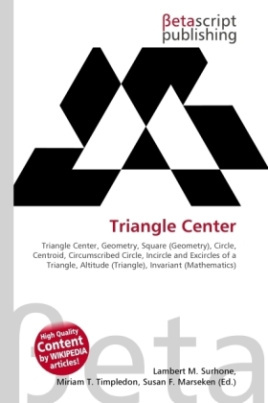 1922), which are not invariant under reflection and so fail to qualify as triangle centers.